In March, Stefan Verner ditched work to go to a Honda dealer and put a $5,000 deposit down on a car, sight unseen, no test drive. He didn’t know how much the car would eventually cost. He didn’t know when it would arrive. He didn’t even know what colour it would be. All that work, and Verner is only second on the list for a Type R at his local dealership in Nova Scotia. To those outside the hype bubble created by the Civic Type R, Verner’s behaviour is unusual, to say the least. Who buys a car without knowing the price? Who cares this much about a Honda Civic? Since 1973, Honda has sold two million of them in Canada; they’re as common as potholes. 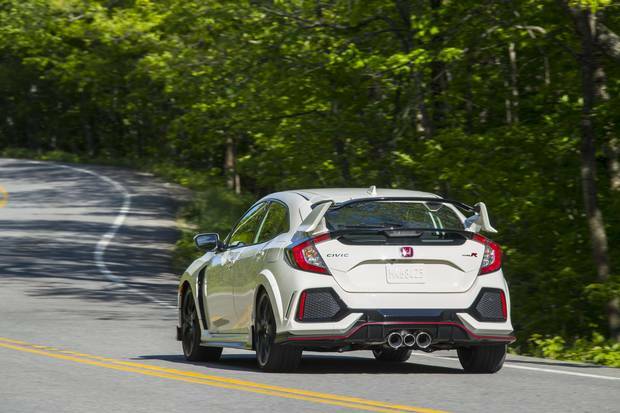 The 2017 Civic Type R will arrive in Canadian showrooms for the first time this summer. The answer is found in that red “Type R” badge. It says that this is no ordinary economy car; it’s a fast one. 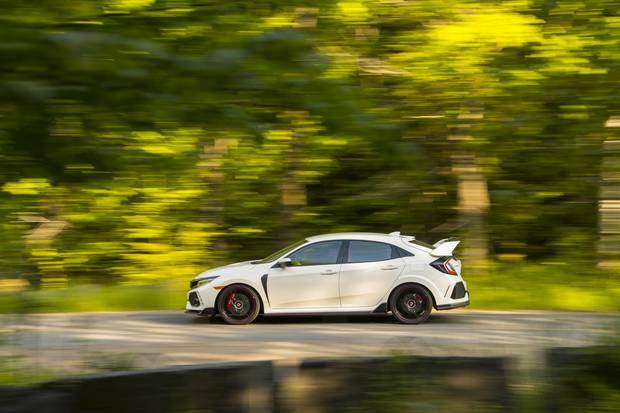 Honda claims the new Type R is the fastest front-wheel drive car around Germany’s Nurburgring. Among certain gearheads – those who grew up in the ’90s and early ’00s, a golden age for Japanese sports car – Honda’s Type R models have a kind of mythic status. They’re rare, high-performance jewels with the best parts, the most attention to detail, instilled with all of Honda’s motorsport know-how. All versions of Civic Type R (CTR) have been forbidden fruit, denied to Canadian drivers – until now. This summer, the 2017 Civic Type R will arrive in Canadian showrooms for the first time, belatedly fulfilling the wishes of Verner and all diehard Honda fans who remember the golden age of the nineties. The mission of the Type R is to re-ignite Honda’s fire from the golden age of the nineties. Unlike a Porsche or Ferrari, a Honda Type R was a realistic dream car for a penniless suburban teenager. For Verner, the Type R will be his fourth Civic. He’s spent $11,000 upgrading his current 2010 Si coupe with a new engine, supercharger, hot cams, new valves, wheels and suspension. Back when you couldn’t buy a Type R in Canada, you could build a reasonable facsimile with aftermarket parts and help from the Internet. That’s what Rob Silva did. He had the Type R poster on his wall as a teenager. A little older now, he’s poured his time and money into creating a 1998 Civic Type R lookalike that’s even more impressive than the real thing. The engine bay is cleaner than your kitchen table. On Instagram, he and his Civic have more than 45,000 followers. Silva is disappointed it took Honda this long to bring a genuine Type R to Canada. “They had performance cars for us in the nineties, but then they just lost that fire,” he says. The Type R’s mission is clear. It must re-ignite Honda’s fire and bring back some of that golden age. “It’s about inspiring enthusiasts again,” Silva says, “because they haven’t done that in, what, 20 years basically. For the Honda-loyal fans, [the Civic Type R] is going to be make or break.” If it’s good, some of those teenagers – now adults – who worshipped the Type R will come back to Honda. If not, Honda’s remaining credibility as a performance brand will evaporate and those last diehards who haven’t yet moved on to Volkswagen Golf Rs or the Ford Focus RS or the Subaru WRX STI will have no reason to stay loyal. Red seats are a Type R tradition. The new Civic Type R looks like an anime character got chopped up and reincarnated as a car. It’s all jagged, pointy shapes. There’s an angry-looking grille, gaping air intakes, vortex generator spikes above the rear window, three exhaust pipes and that wing, which belongs on a Star Wars set. The Type R looks like it’s trying very, very hard. 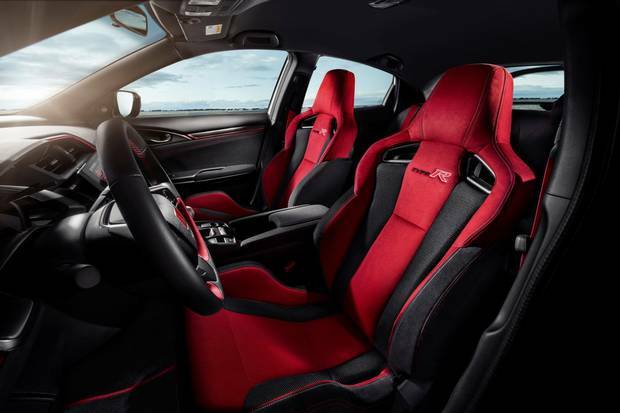 The seats are red, a Type R tradition. A round aluminum shifter sticks up from the centre console. A six-speed manual is the only gearbox on offer. Everywhere, badges remind you this is no ordinary Civic. But, actually, the cockpit doesn’t look all that different. There’s the same, sluggish touchscreen infotainment system found in other Hondas. Older Type Rs were stripped-out machines, rid of all creature comforts in an effort to improve the power-to-weight ratio. The Type R has a 2.0-litre turbocharged four-cylinder engine. The 2017 Type R is the heaviest ever, and the heaviest version of the Civic on sale today with a curb weight of 1,415 kg. To compensate, the Type R is also the most powerful Honda ever sold in Canada. The 2.0-litre turbocharged four-cylinder engine is unique to the Type R, producing 306 horsepower at 6,500 rpm and 295 lb-ft of torque from 2,500-4,500 rpm. Fuel economy is surprisingly good, officially rated at 10.6 L/100 km city and 8.3 highway. The mechanical changes over the regular Civic are impressive. There’s a completely new front suspension layout featuring beefy anti-roll bars, aluminum knuckles and lower arms. It uses a dual strut design that separates steering and suspension forces, which Honda says helps to reduce torque steer. The car rides on 20-inch rims shod in bespoke Continental Sport Contact 6 tires, the same size front and rear. Honda isn’t letting us drive the Type R on the street, which is strange, but they’ve booked the Circuit Mont-Tremblant for the day. Starting the Type R in the pit lane is anticlimactic. The engine fires with a muffled hum that doesn’t live up to the promise of the car’s ridiculous look. The gearbox is excellent, though, notchy with a short shift. The clutch is heavier, beefed up to deal with the extra torque. But even as the revs build, the engine is strangely silent. That’ll be the first thing most owners change. It doesn’t drive like a front-wheel drive car. The steering wheel doesn’t writhe with torque steer as you ask the front tires to put down 300 horsepower. The Type R is easy to drive quickly, with handling that never strays far from neutral. The first corner at Tremblant asks you to trust the car as you fly over a blind right crest in fifth gear. The steering is sharp, with enough feedback that you can feel the grip at the wheels as the car goes light. The suspension is stiff, but almost sublime in the way it takes the edge off curbing and ruts. The car saw 185 km/h on the speedometer on the back straight. Braking and shifting down to third, the Type R automatically rev-matches, blipping the throttle on downshifts. Or, you can disable the system if you want a fully analog experience. The big four-pot Brembo stoppers don’t fade, reliably scrubbing off speed lap after lap. Pushing faster, the Type R proves flattering. It’s an easy thing to drive quickly with handling that never strays far from neutral. Want to stay on the brakes deep into a turn? No problem. You can feel the back of the car rotate more than the front, just enough to help turn-in but never enough to become full-on oversteer. Feed in the throttle and you feel the tires scrabbling for grip, and finding it, thanks to a helical limited slip differential and a system that drags the brakes on the inside wheels. It’s a great car on a race track and – provided they could live with the stiff suspension – it’s not hard to imagine those Honda diehards driving this car every day. The Type R costs $40,890 and comes fully loaded. There have been four versions of the Civic Type R since 1997. This is the fifth, and the first one in Canada. Cars for those first few to put a deposit down on a Type R should start to arrive in mid-July. The price, in case they care, is $40,890 and it comes fully loaded. There are only two colours: black or white. It’s a shame we had to wait so long for a Type R. Was it worth it? Honda loyalists such as Verner, Daoust and Silva who got into the brand in its performance heyday aren’t teenagers any more. Like them, the new Civic Type R has grown up. Although it’s ready for a track day right out of the box, it’s not too extreme. It’s a little bigger, a little heavier than the ultralight Type Rs of the nineties. It has more creature comforts, more space for passengers and cargo. It’s a practical four-door hatchback. Although it still looks like something a teenager would dream of. This entry was posted in Civic Type R on July 7, 2017 by Administrator.